The $39.95 ($36 with autopay) plan's high speed data allotment has been increased from 3 GB to 5 GB per month. The plan also includes unlimited talk and messaging and unlimited 2G (64 kbps) data after the first 5 GB. The $55 ($50 with autopay) plan now includes "unlimited" high speed LTE data instead of 10 GB and unlimited 2G. As before, unlimited talk and messaging is also included. The $69.95 plan which, like the new $55 plan, included unlimited talk, messaging and data has been discontinued. While unlimited LTE data for $55 sounds nice, Page Plus terms of service say that if your data usage is abnormally high they may "interrupt, suspend, cancel, or terminate your service". While many carriers terms have similar language, TracFone, Page Plus' parent company, is one of the few to actually be fined by the FCC for throttling and cutting off customers unlimited data plans for using too much data on unlimited plans. Page Plus' terms also prohibit using your phone as a hotspot. In other Page Plus changes, it looks like LTE phones might finally be allowed on the $12 plan. 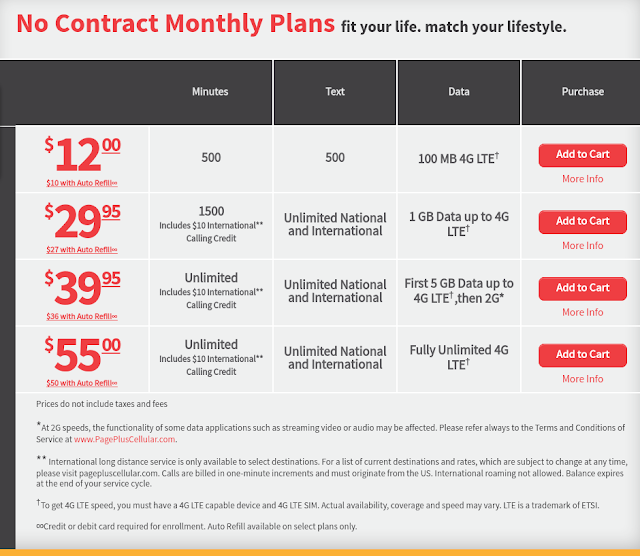 On the Page Plus site, as shown in the screenshot above, the plan is described as including 100 MB of LTE with a footnote reading "To get 4G LTE speed, you must have a 4G LTE capable device and 4G LTE SIM." In the past LTE capable phones were not allowed on the $12 or Pay As You Go plans. I'm hoping this isn't a typo and that the restriction on LTE phones on Page Plus' lower cost plans has finally been lifted. It also looks like the price of data on Page Plus' Pay As you Go Plan has been reduced from 10¢ to 5¢ per MB. See our Prepaid Operator Profile: Page Plus for detailed information about the Pay As You Go Plan. Page Plus is sold primarily by independent dealers and online. Formerly an independent MVNO, Page Plus was acquired by TracFone in 2014. I just copied this for their Q & A section. Q. Which Page Plus monthly plans provide 4G LTE service? A. Currently, you can get 4G LTE data speeds with a compatible 4G device on our monthly plans: the $12.00, the $29.95, the $39.95, and the $55.00. Q. How do I upgrade from 3G to 4G? A. This cannot be done with a 3G phone. To use our 4G services you will need to get a compatible 4G LTE device, as well as a Page Plus 4G SIM card. The account will also need to be on a qualifying monthly plan of $12.00/month or higher. Monthly plans are 4G eligible. If you have a 4G device that has been “flashed,” or reprogrammed, to work on 3G, then you will need to check with whomever flashed the device to see if they can “unflash” it back to 4G. Devices made for any other network cannot be used with Page Plus 4G LTE services. Dang! PP's website says 'Pay-as-u-go' plans are still 3G only. LOL! Yeah, I thought they're pretty much irrelevant now. I've never heard of a prepaid using the kind of verbage as far as suspending or cancelling one's plan, depriorotized yes, but outright cancellation based on some arbitrary number? RingPlus liked to destroy accounts that used more than a few hundred MB out of a 5 GB monthly plan. Carlos Slim. JUST SAY NO. 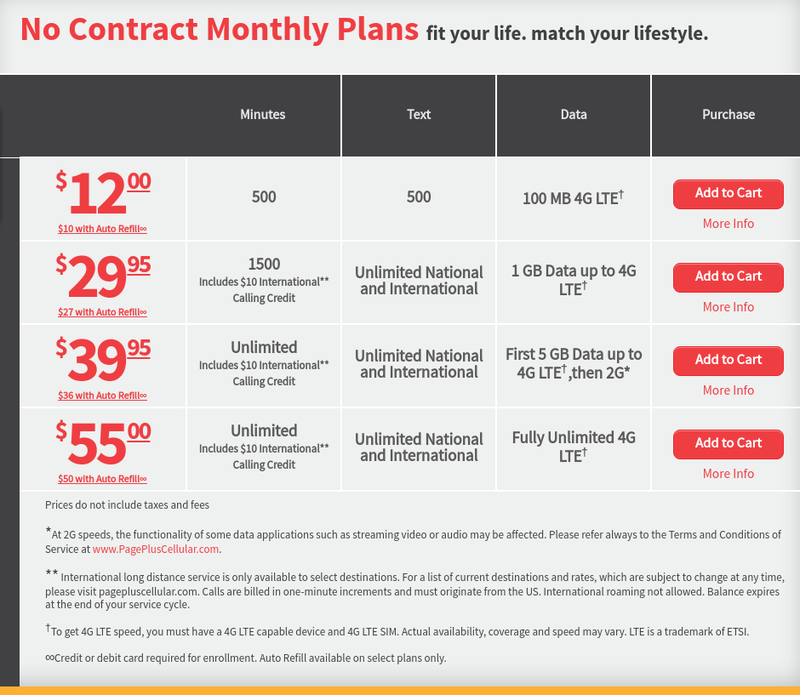 The $50 unlimited plan is pretty good considering it's on Verizon, and all fresh Trac phones work on any sub-brand. Just gotta find a good deal on a ST or TW J7. Don’t want to offend the sponsors with the AUTO-SUSPEND feature? since when does any trac phone sub brand phone work on any trac phone sub brand? can anyone confirm this? New, never used iPhones SE and 6, sold for one TracFone brand have been reported to work on a different TracFone brand. I've also seen reports of brand new CDMA Android phones sold for Straight Talk, Net10 or Total Wireless being activated on a different TracFone brand, including on Page Plus, using the original SIM that came with the phone. Many AT&T network phones made for one TracFone brand have been reported to work with a BYOP AT&T SIM from a different TracFone brand. Some combinations aren't going to work, such as a CDMA phone without GSM or UMTS support on a GSM based service. Also, Verizon network phones are "Slim-locked" to the first TracFone brand they are used on. LOL! "Slim locked" ... love it!